This, I'm afraid, is another tiny-busted wonder (pay no attention to the endowment of the illustrated women, only to the measurement on the envelope). It's from eBay seller oncillakat, who seems to have a lot of fun stuff up right now. This caught my eye, though, for the repeated petal motif. If I were to make this dress (which I'm not, because, well, it's not my size) I'd go way over the top with it. I'd make it in pale green satin and cover the whole thing with intricate Callot Soeurs-type silk ribbon embroidery. Tiny flowers, or some such. You know what I mean. I'd have a horizontal vine motif running through the midriff band, too. Maybe even with beads — and I don't usually wear beaded things, so you know I'm serious, here. 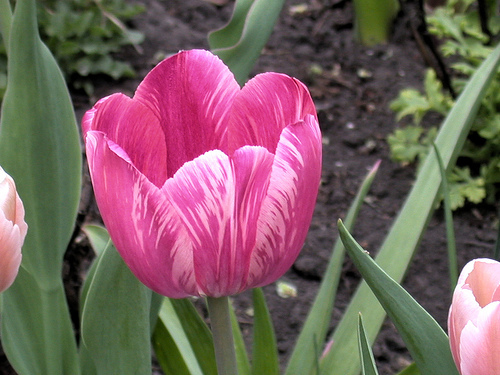 Another wonderful way to play up the tulip skirt would be to embroider it as if it were an actual variegated tulip. Imagine this kind of coloring on that skirt, done in satin-stitch embroidery, or, better yet, bugle beads! Of course, since I don't do silk ribbon embroidery, or beading, or, even satin, really, this dress remains purely notional. But if YOU do all the above, please, feel free to take this idea (and buy this pattern) and run with it. Just send me a jpg, 'kay? Wonderful dress, even more wonderful fantasy. Good thing it’s a fantasy; did you notice the funny straps on the sleeveless version? I wonder if they would feel as though they were perpetually slipping off?OOPS! I think my pattern-drafting eye is on active-mode: I should just enjoy the great petals all over and remember when I could look at patterns and not even notice such things. Now I need to shift into “neglect to notice” truly to enjoy, even though I’ll never make it. I guess MY fantasy is that I just might, so must eyeball all details with that in mind. Sigh. I wish… I wish… I love beading, and embroidery, and satin. Maybe one day! Those ideas are great. I’m wondering why the neckline is so high. It could come down a good two inches without looking too tarty. . . Now wait a minute, couldn’t you go strapless on this one? Wow, wouldn’t that be absolutely superb? One of the versions has no modesty panel, so my guess is that plunge suffices for evening gown skin-baring, despite the relatively high neckline. It IS so much like architecture: makes one curious just how, and what happens to the boobies behind those big petals on the one w/o the panel.The neckline is also good-to-go for the day version, too. Cool dress. The sleeve strap thingys really bother me. Other than that it’s lovely. I would be fun to have a pattern liek that to a be a tulip for Halloween …or just to be a tulip in spring. Ohhhhhh…I am green with pattern envy. love those dresses!I’d wear them! Man, this is a super blog. I’m glad to know I’m not the only one who is fascinated with old-timey dress patterns. Yay! just found this, great blog.. 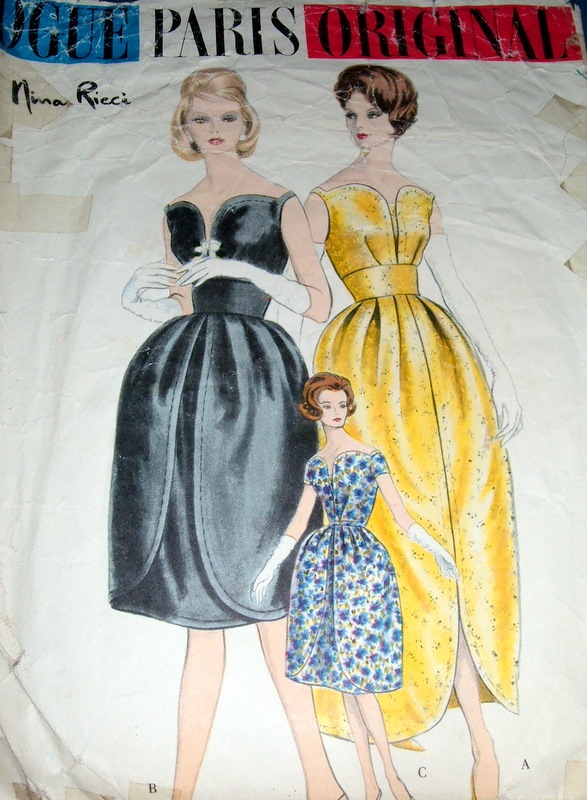 Fantastic dress pattern. Drool-fabulous. Gosh, I miss you!…and Erin, I greatly appreciate the title of the post. Now I’ve got that song in my head. Rest assured that I welcome its visit.